The NVIDIA GeForce GT 550M is a fast middle-class graphics card for laptops. It is based on the GF108 core, which is similar to certain GeForce 400M cards but with higher clock speeds. Therefore, features like PureVideo HD (VP4), 3DVision, HD Audio support and others are identical to the GT445M. The GF108 core of the GTX 550M is related to the GF100 core of the GeFore GTX 480M, but offers only 96 shaders and a 128 Bit memory bus for both GDDR5 or DDR3. More information on the GF108 can be found on the GeForce GT 435M page. The performance of the 550M depends on the used graphics memory. If using DDR3, the card is on a similar level with the Radeon HD 6750M. Demanding games such as Crysis 2 are playable in 1366x768 and high details. Higher resolutions at maximum settings will not be playable in demanding games like Metro 2033 or Bad Company 2. See below for detailed benchmark results. A novel feature of the GF104/106/108 chips is the support for Bitstream HD Audio output via HDMI for Blu-ray playback. Similar the Radeon HD 5730, the GT 550M can transfer Dolby True HD and DTS-HD bitstream without quality loss to a HiFi receiver. The GT550M offers the PureVideo HD technology for video decoding. The included Video Processor 4 (VP4) supports feature set C and is able to fully decode MPEG-1, MPEG-2, MPEG-4 Part 2 (MPEG-4 ASP - e.g., DivX or Xvid), VC-1/WMV9, and H.264 (VLD, IDCT, Motion Compensation, and Deblocking). 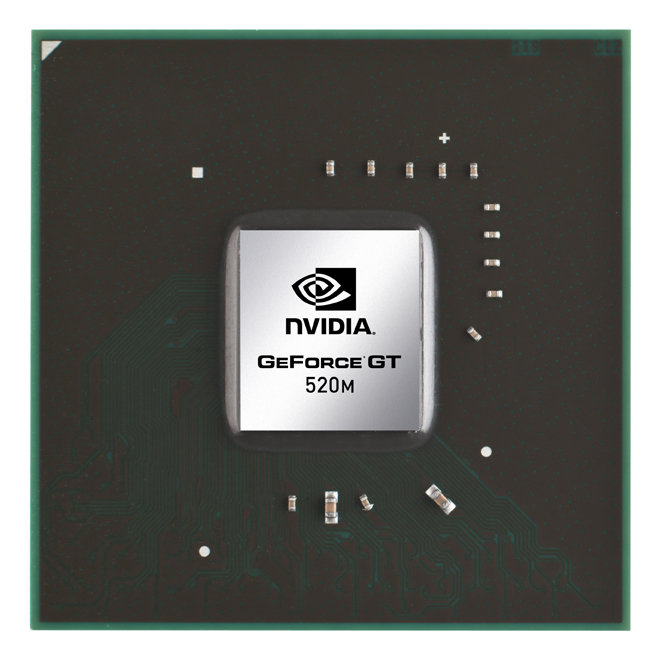 Through CUDA, OpenCL and DirectCompute 2.1 support, the GeForce GT 550M can be of help in general calculations. For example, the stream processor can encode videos considerably faster than can a modern CPU. Furthermore, physics calculations can be done by the GPU using PhysX. Certain games, such as Mafia or Metro 2033, natively support this feature. According to Nvidia, support for 3D Vision on the GT 500M series is also new. It enables the laptop to send 3D content (3D games, 3D Web Streaming, 3D photos, 3D Blu-Rays) to a built-in 3D-enabled screen or an external 3D TV if supported by the manufacturer. The relative high power consumption of the GeForce GT 550M suits it for 15-inch or larger laptops. To save power, the card supports Optimus to automatically switch between the integrated graphics card from Intel and the Nvidia GPU. Most notebooks with GT 5xxM GPUs support this feature, but its implementation is dependent on the laptop manufacturer.